The Eretz Israel Museum in Tel Aviv is a stunning museum spread across a beautiful campus in the Ramat Aviv district of the city, overlooking the center of Tel Aviv. The Eretz Israel Museum has an amazing array of displays relating to archaeology, judaica, ethnography, history and culture and arts and crafts, each housed in a pavilion, of which there are many spread across the museum site, centered around an archaeological site. The Eretz Israel Museum has interactive displays, working reconstructions, and a planetarium mean there is something at the museum for just about everyone. Displays include wine and oil presses, a flour mill, and a “craft arcade” where visitors are able to seethe traditional working tools common used in the Land of Israel. 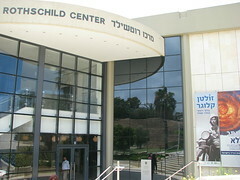 It makes sense to visit the Eretz Israel Museum at the same time as Beit Hatfutsot (the Museum of the Diaspora), which is located a few minutes away also in Ramat Aviv. Which, together, are two of the best museums in Tel Aviv. The museum also has a fantastic, large gift shop and a great cafe. Monday, Wednesday: 10 a.m.-4 p.m.
Saturday: 10 a.m- 4 p.m.